Cherokee: You know, boys, it would be right peaceful here if this whinin' and playin' suddenly stopped. Just like another country/western star, Gene Autry, was brought to Hollywood to be a singing cowboy, the fledgling Grand National Pictures hired Tex Ritter from the Grand Old Opry to be its singing cowboy. It was a good move, though Grand National never gave him quite the same decent properties as Republic did Autry and Roy Rogers. 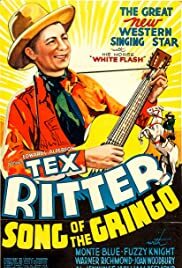 Song of the Gringo was Tex Ritter's debut film. Tex is a deputy sheriff who goes undercover to foil a dastardly plot by outlaws who are killing various mine owners who've been financed by Joan Woodbury's father. The climax of this scheme is for the head villain to marry Woodbury. Even bearing in mind that this was for the Saturday matinée kiddie trade, Tex is hardly convincing as an undercover operative. In fact one of the outlaws, Warner Richmond, has suspicions about him from the gitgo. All undercover guys ride a very noticeable white stallion named White Flash which was Ritter's horse as Trigger was to Roy Rogers and Champion to Gene Autry. Playing a bit role as a judge is real life desperado, Al Jennings who had a colorful career in the previous century and showed Ritter the movie cowboy ropes. It's worth seeing Song of the Gringo just to see a real part of western history. And Ritter himself is a man with a pleasant voice and easy to listen to. Also look for Fuzzy Knight as the sidekick and Monte Blue as the sheriff. And dig that Perry Mason like ending.